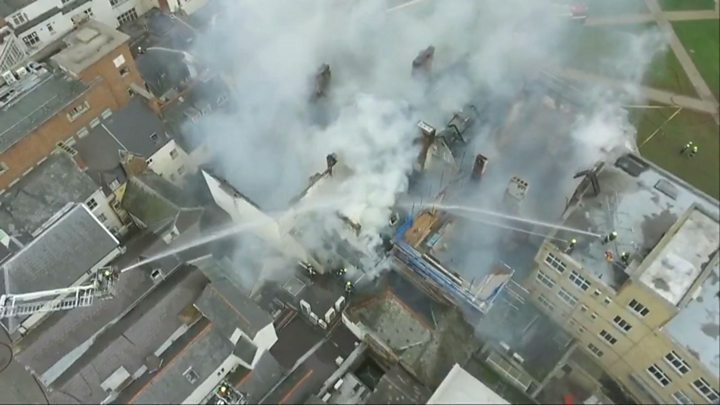 A fire in Exeter has destroyed historic buildings including what is described as the oldest hotel in England. The fire began at around 05:00 BST in buildings on Cathedral Green in Devon and spread to the Royal Clarence Hotel, which dates back to 1769. Guests have described being evacuated from the building, which dates back to 1769, amid flames, ash and debris. Historian Dr Todd Gray said the Royal Clarence was the first venue in England to call itself a hotel. Drone footage released by police has revealed the level of devastation. South West Water has asked city centre residents to restrict water use and promised to supply bottled water for people struggling to get water from taps. Hotel guest Lucy, from Australia, told Radio Devon: "I was woken up by the fire alarm at five o'clock. Someone was banging on the door and all I could see were orange flames through the window. A Canon at Exeter Cathedral said she had seen "flying debris". Anna Norman Walker, who could see the fire from her window, said: "The main concern was a lot of debris flying from the roof of the affected building which was travelling - certainly some of it made it to the roof of the Royal Clarence Hotel." The hotel has been evacuated and all staff and residents are accounted for. There are no reported casualties. A spokesperson from the hotel said: "We are continuing to monitor the situation and send our sympathy to our neighbours and all those affected by the fire." Talking about the hotel's history, Mr Gray said: "It's the building where they first declared themselves as a hotel, before that we had inns, but they took the new French word and applied it to their building. This was the place to stay. "All these buildings have medieval origins and the buildings in between are very fine 17th century buildings of Exeter at its height. So whatever you see from the outside, it's got a deeper, more interesting past just behind the plasterwork. "It's hugely significant for Exeter." 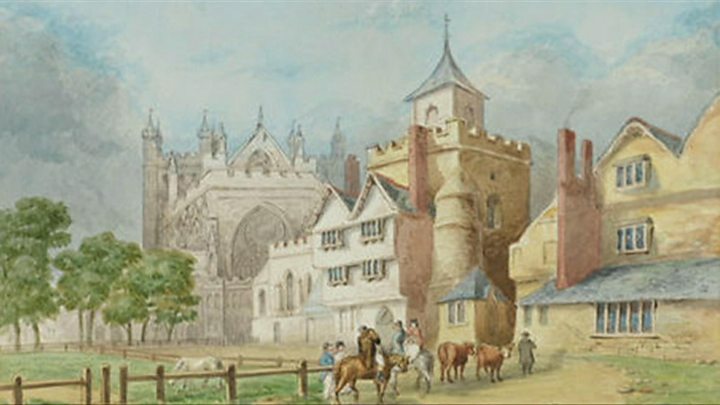 Cathedral Green was the medieval hub of the city. It's not only where the church was concentrated, but it was the business hub of the city from the 15th to 18th centuries. This is where all the trade took place, this is where you did your business deals. It was also where the anti slavery people met in the 1700s and 1800s, where they planned abolition. Beatrix Potter came here in 1892 and looked out and said 'what a fine view this is'. It was the place to be. But the hotel had a murkier past later on when it was where the fascists met in the 1930s. Millions of people over the years have poured into the close to have a look. Gentlemen would rent rooms all year just to have a presence in Exeter. To lose this would be a great tragedy for Exeter. It's a key building - it's the heart of the city. About 110 firefighters, police and paramedics are at the blaze, which began at about 05:20 BST. They have have sent a team to take water from the river Exe "as a contingency measure". Incident officer Bill Haberton, from Devon and Somerset Fire and Rescue Service, said they were "throwing a lot of resources" at the fire. He said: "We're going to be taking water from various locations because we're overrunning the water supply in the middle of Exeter at the moment." A couple who live in a pub nearby evacuated for fear of the blaze spreading to their premises. Kirsty said the flames had gone up quickly. She said: "We heard the noise and looked out the window and saw the flames and decided we didn't want to be there. "We'd seen the flames go up, it's a bit scary really. "The pub we live in is made of wood so we didn't want to be there really." Rob added: "It brings it home a bit, it's a little bit scary. You don't think a building would go up that quick but it's gone." As a result of the fire, Queen Street, High Street, Cathedral Green and other surrounding roads are closed. Image caption Witnesses described the fire as "scary"